Like many men, my first foray into the world of formal menswear was born of necessity; I was starting a job that would require professional attire for meetings and other corporate events, but I wouldn’t be wearing a suit daily. I’d owned a suit from a mall brand that was purchased in high school for a formal event and hung in my closet through my college years. This time, I wanted to do some research before spending my hard earned money. 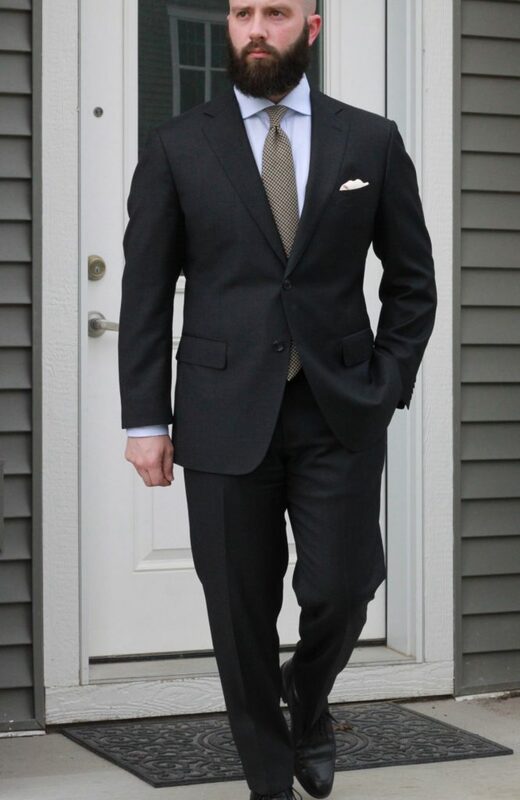 Initially, I thought, “How hard could this be?” and after some cursory searches on the internet and reading a handful of “Every man should own…” articles I settled on a navy suit from a big box retailer. Roughly $600 later (after alterations) I was set. Being confident in my expertise, I continued to read about menswear – perhaps seeking further validation for my purchases. At this point, I had learned just enough to not be entirely pleased with my first purchase. Enter Styleforum. From here I found two brands that appealed to me from a value standpoint: Suit Supply and Spier & Mackay. I knew I needed more than one suit, and having “locked down” (read – spent the money already) the basic navy, a charcoal and a lighter grey were next on my list. I opted for the Lazio cut from Suit Supply in charcoal perennial wool from Vitale Barberis Canonico. At the time I hadn’t given much thought to the importance of proper proportions or even what kind of details were important to me – buttoning point, lapel width, jacket length, etc. The one detail I did notice was functioning sleeve buttons, which I thought was cool and a testament to it being high quality. Unfortunately for me, the sleeves needed to be shortened and after having spent some time in the store I was too embarrassed to walk away after being quoted the alterations cost. From Spier & Mackay I decided on a light grey flannel suit, thinking it would be useful in the colder climate I’d be living in. This time the alterations cost was much more palatable, and if I remember correctly I walked away with a couple of white dress shirts as well (more on that learning curve another time). Neither suit fit perfectly; higher buttoning point, larger armholes and narrower lapels than what I like now. I was overconfident in my newly acquired knowledge, and in the case of Suit Supply, I’d fallen into a bit of a mental trap where the brand name appeal overpowered my ability to think more critically about the purchase. So, if I can share some internet wisdom – if you’re finding yourself drawn into the world of menswear for work or personal enjoyment I’d strongly suggest taking the time to research. Not just the nuts and bolts of the suits and the brands that produce them, but turn a critical eye to some of the photos you like on forums, blogs, Instagram, etc and ask yourself what about those outfits makes you like them? does the width of the lapel land in the middle of the shoulder? wider? narrower? what do the shoulders look like? does the buttoning point drive clean lines down the lapels and around the waist? is the jacket length appropriate (covers the seat, equally splits the top and bottom halves visually)? One last note – be prepared to have your tastes change and evolve over time. My aesthetic has changed a lot over the last few years as I’ve learned more, tried more and engaged with the community more. There will be instances of regret. But that’s ok, it’s all part of the journey – just don’t spend too much on your first rodeo.